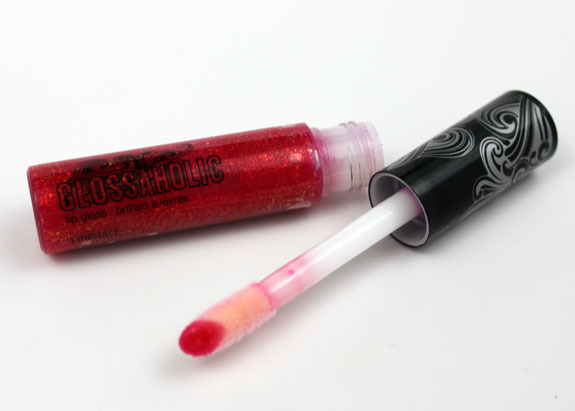 Hard Candy has some seriously sparkly new lip glosses out called Glossaholic Sequin Saturated Shine Lip Gloss. They come in a fatty tube, which I really love for some reason. What I don’t love so much about the container is they are very similar to the MAC Wonder Woman Lipglasses. 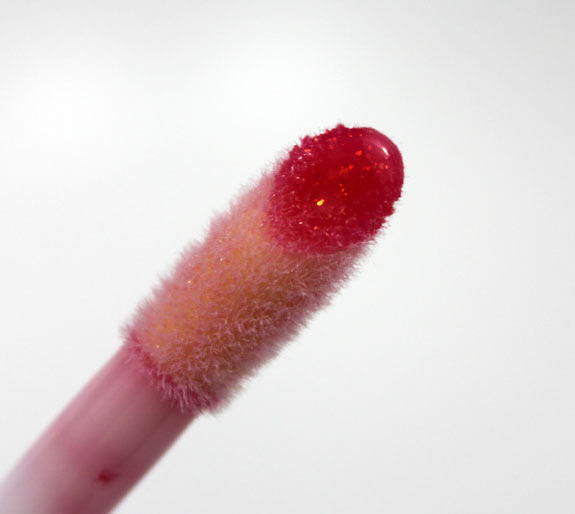 The wand is in the tube TIGHT so you have to really yank it out, risking splattering gloss all over. These are very sparkly and glossy and feel pretty darn moisturizing and not TOO sticky. 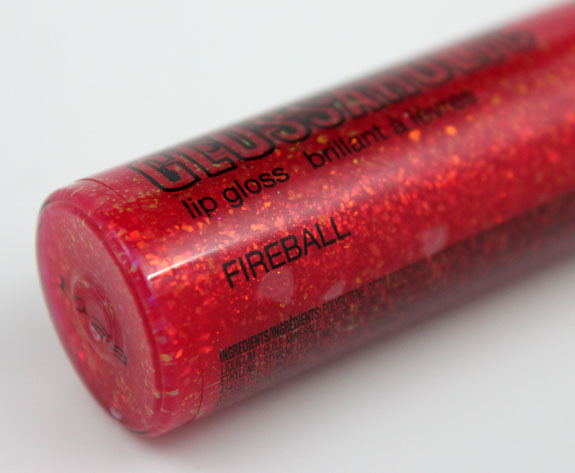 Fireball looks really intimidating in the tube, like it would be a hugely bright red color. In fact, it’s a subdued red, more of a raspberry really. The base color isn’t very saturated, it’s more of a stain so you don’t get huge color payoff with it. The flake glitter is what makes this unique and fun. It’s different sizes and changes from gold to a pink/red color. As you can see there isn’t a ton of actual color on the lips, pretty subtle. I took a darker photo so you could see how glossy it is and the cool flakies better. Love! I am definitely intrigued enough to want to check out a few of their other colors in this line. 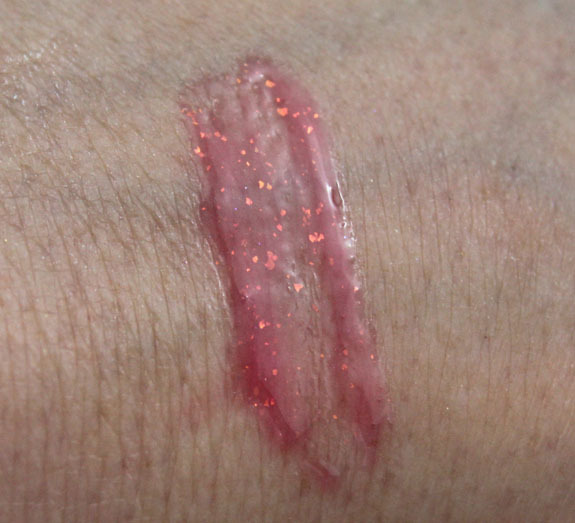 You can wear these over a lipstick also if you want more of a color impact, but I kind of like this one on it’s own. I have one of these and I am glad I got it but the scent/taste is a bit much to bear and the flakies NEVER COME OFF omg. I ended up getting them on both my husband AND son not to mention they were all over my face! But these are unique so I am still glad I got it, I just am not sure how often I’ll be wearing it. Same thing happened to me when I just just tissue to get it off. When I used a MAC wipe it mostly all came off. Hi, yeah I bought a couple too and love the colors and how it stays on but the taste is too much for me too! Its like lip smackers or pre-teen gloss. I would wear it more but when I see it i think yuk that sweet taste! 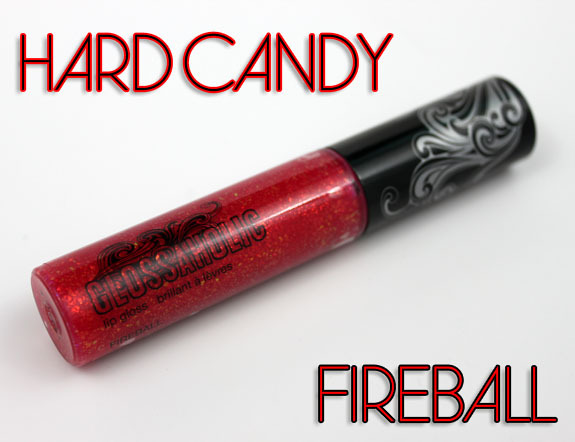 I have this in Gorgeous and wish I had bought this one because the color of gorgeous in the tube does not show up on the lips. It just looks like a clear gloss. I don’t really care for glitter in my lip glosses and I wasn’t sure about the flakes, but i actually really like them. They look cool. Yeah I don’t normally either but something about flakies I love! I have this in Gorgeous as well as the ‘aromatherapy’ vanilla one that tastes and smells like cupcakes! I love both of them! The flakes remind me of the MAC Superglasses! I actually don’t mind that the colour isn’t as bold as the tube would suggest. It’ll be good to layer with. I don’t really shop at Wal-Mart other than for Hard Candy stuff. Looks like I’ll have to make another trip. Hard Candy has really been impressing me. I’ve got to check these glosses out! I bought 3 of these just because they have flakies in them. I just wish the flakies wouldn’t adhere so much to your lips. I hate when the gloss is gone, but you still have random flakes here and there. I LOVE how this gloss looks on you! The flakes make it. Thank you so much for reviewing this! I saw them @ Walt-mart this week and I was really interested. I like how the flakes looks. does anyone know where i can buy that glitter on wholesale? or what is the industry name for it? I have a couple of these and when the gloss wears off it leaves the flakies behind, giving me a scary pair of lips in between reapplying! I’ve only worn it once. Wish they were more pigmented! Not a fan of this formula. I harken back to the days when this brand was high end at Nordies. It was good then…always sought after by teens – but this old lady would pick up a glitter liner (one of the first brands to do that even).